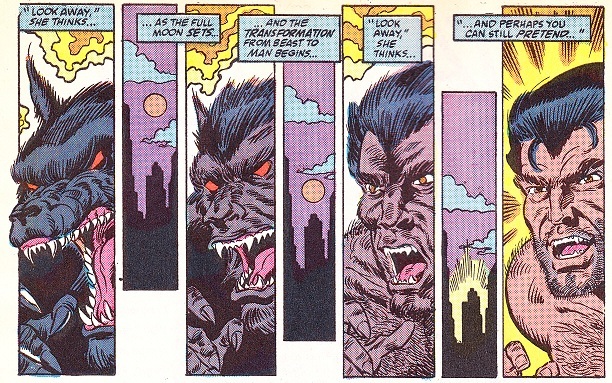 Powers/Abilities: A mutant, Eduardo Lobo could transform beneath the light of the full moon into a superhumanly strong (lifting ten tons) and durable humanoid wolf creature. In this form, he was resistant to conventional weaponry, but could be harmed by silver; he also possessed enhanced senses of hearing, scent, and vision. He retained his human intelligence and power of speech in this form, but was subject to savage animal instincts. He apparently could not transform into this form during the daytime or when the moon is not full, nor could he retain human form during a full moon. 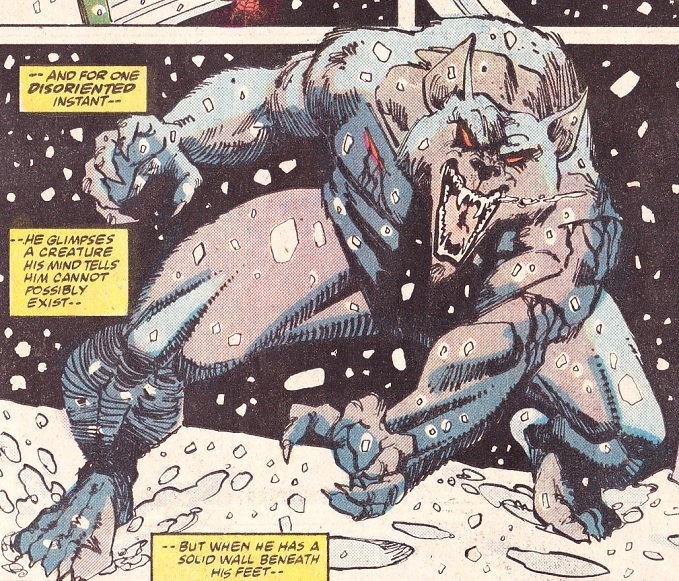 In his human form, Lobo possessed peak human strength and agility, and excellent night vision. He was a skilled criminal mastermind, and spoke fluent Spanish and English. History: (Spectacular Spider-Man II#152 (fb) ) - Carlos and Eduardo Lobo's mother died giving birth to them; they never knew their father. They grew up alone on the streets of Zaragoza, Mexico, stealing to survive. Even then, they always stole by night. Eduardo often watched the beautiful and wealthy Esmelda Valdez riding her horse on her father's ranch; one evening, her horse scented him and bolted, throwing Esmelda to the ground. Eduardo helped her up, and over the course of the next two months they fell in love, and became inseperable. One night, however, beneath the light of the full moon, Esmelda's brother Ramone, who disapproved of the relationship, came after them on horseback with a gang of men. As Ramone lashed him with a whip, Eduardo transformed for the first time into a lupine monstrosity; in a bestial rage he slew Ramone, his men, and Esmelda. (Spectacular Spider-Man II#143 (fb) ) - Together, Carlos (who possessed the same powers as his brother) and Eduardo killed the leaders of the warring gangs of south Texas, and united the survivors behind them as los Hermanos de la Luna (the Brotherhood of the Moon). A year later, they moved their headquarters to a mansion on Grapevine Lake, outside Dallas. (Spectacular Spider-Man II#143 (fb) ) - Carlos and Eduardo were arrested and tried, but freed after a mistrial. (Spectacular Spider-Man II#143) - A year and a half after the Lobo takeover of the south Texas gangs, the Kingpin and his right-hand man the Arranger sent their agent the Persuader, their henchman Andrew, and the brainwashed Punisher to Dallas to assassinate the Lobo Brothers, fearing their ambitions. They arrived at their Grapevine Lake mansion and shot Carlos in the shoulder, but Spider-Man's timely arrival resulted in the Punisher breaking the Persuader's mind control; she shot and killed Andrew and the Persuader and left. As Spider-Man departed as well, Carlos swore vengeance on the Kingpin. (Spectacular Spider-Man II#145 - BTS) - Arriving in New York, Carlos or Eduardo (or both) brutally murdered Teddy Tones, a courier for the Kingpin, at the Central Park Zoo, leaving KINGPIN: WOLVES BITE BACK scrawled on a cage wall in his blood. (Spectacular Spider-Man II#146 - BTS) - Carlos and Eduardo (or both) slaughtered twenty of the Kingpin's lieutenants in the Starlight Room ballroom, leaving KINGPIN - WOLVES KILL written in blood on a tablecloth. 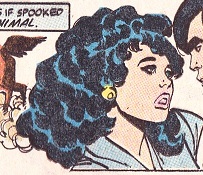 (Spectacular Spider-Man II#146) - Eduardo "accidentally" bumped into Glory Grant in the Daily Bugle's lobby, knocking her purse out of her hands. Picking it up for her, he apologized profusely and insisted on taking her to lunch. (Web of Spider-Man I#47) - Having spent the past day together, Eduardo and Glory walked through a shopping center; when the escalator they were on went berzerk (as it was possessed by demons under the command of N'astirh), Eduardo grabbed Glory and leapt to safety. 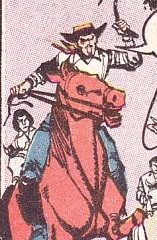 (Web of Spider-Man I#48) - The next day, with the streets swarming with demons, Glory and Eduardo raced to the Bugle. They encountered a possessed, monstrous forklift; when it attacked them, Eduardo slew it with a fallen pipe. 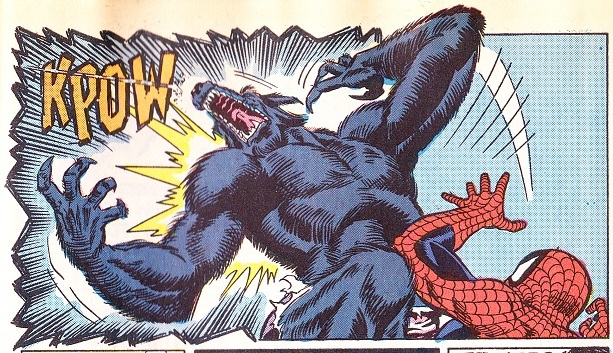 (Spectacular Spider-Man II#149) - In wolf form, Eduardo ambushed a cash delivery at the Kingpin's vault, killing seven of the Kingpin's men and scrawling KINGPIN: THE WOLVES COME FOR YOU! on the vault wall in blood. (Spectacular Spider-Man II#149 - BTS) - The next day, Eduardo met Glory for lunch. (Web of Spider-Man I#50 - BTS) - Carlos and Eduardo (or both) attacked one of the Kingpin's ships, killing the crew and writing WOLVES TAKE REVENGE in blood on the hull. 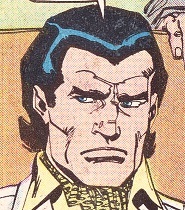 (Web of Spider-Man I#50) - At their suite in the Plaza Hotel, Carlos asked Eduardo how his seduction of Glory Grant was proceeding; Eduardo assured him that she would do anything he asked. (Spectacular Spider-Man II#150) - Eduardo slew a number of the Kingpin's men in a subway station; Spider-Man, hearing the screams, arrived to investigate, but he only caught a glimpse of Eduardo before he crept away to Glory's apartment, where he was almost spotted by Glory's colleague, Joy Mercado. The next morning, Glory found Eduardo in human form on her floor, naked and bleeding. As she tended to his wounds, he asked her to steal the Bugle's files on the Kingpin for him. She was initially reluctant, but soon succumbed to Eduardo's charms. (Web of Spider-Man I#51) - At the Bugle, Glory gave the stolen Fisk file to Eduardo. That night, Eduardo, in wolf form, attacked the Arranger's limousine. Spider-Man intervened, and narrowly avoided being disemboweled by the lupine Eduardo, who finally fled when the Arranger's driver shot him four times in the chest. (Amazing Spider-Man I#316) - Peter Parker passed by Glory and Eduardo at the Bugle. (Spectacular Spider-Man II#152) - Glory passed out, and Eduardo hesitated, eventually realizing that he could not kill her, as he had killed Esmelda. When she awoke, he explained his origins to her, and claimed that she had "tamed the wolf in [his] soul...". (Web of Spider-Man I#53) - As they prepared to assault Fisk Tower, the Lobo Brothers (both in wolf form) and the Hermanos prepared their assault helicopter at LaGuardia Airport. Spider-Man showed up and briefly battled them before they escaped on the helicopter. (Spectacular Spider-Man II#153) - Carlos, Eduardo, and the Hermanos launched their assault on Fisk Tower. (Web of Spider-Man I#54) - Carlos and Eduardo leapt off the helicopter and tore through the Kingpin's men, eventually working their way to the Kingpin's office. He taunted them, and they tore him apar t...or they thought they had. The Kingpin was gone, having left a stuffed dummy and a remote speaker behind. Carlos and Eduardo departed, leaving KINGPIN - YOU CAN RUN BUT YOU CANNOT HIDE written in blood on his office wall. Later, back at their hotel, they plotted to draw the Kingpin out, and Carlos accused Eduardo of having gone soft thanks to his relationship with Grant. (Spectacular Spider-Man II#154) - Eduardo came to meet Glory outside the Daily Bugle building, but she was lost in thought, and didn't see him. When he finally caught up with her, he assured her that the war with the Kingpin would be over soon. (Dr. Doom's Revenge (comic) (fb) - BTS) - Eduardo was recruited by Dr. Doom as part of his Doom's Brigade, a group of super-villains who would oppose any superheroes who tried to prevent his plot to threaten New York with a stolen Thermo C4VG missile. (Dr. Doom's Revenge (comic) ) - While Doom's Brigade waited to be given someone to fight, they began brawling amongst themselves. Eduardo faced off against Batroc, but Doom broke up the melee, informing them that they were there to serve him and would do only as he commanded. (Dr. Doom's Revenge (game) ) - When Captain America and Spider-Man infiltrated Doom's castle, Eduardo opposed and was defeated by Spider-Man. (Web of Spider-Man I#55) - On the night of the full moon, Carlos, Eduardo, and the Hermanos attacked the streets of New York, causing mass chaos. As the sun began to rise, they escaped in a van. The next day, the Kingpin contacted them, arranging a meeting at the 1964 World's Fair grounds in Queens. Eduardo insisted on bringing Glory along, which Carlos objected to, but allowed. At the meet, the Lobos demanded the Arranger's head in exchange for peace - but before the Kingpin could answer, men sent by rival crimelords Hammerhead and Chameleon arrived and opened fire. As Eduardo transformed into his lupine form, he shoved Glory under the van, and told her her loved her. Eduardo lunged at the Arranger; Spider-Man knocked him aside and took on Eduardo himself. As they grappled, he vowed to kill Spider-Man, but Glory picked up the Arranger's gun (which had been loaded with silver bullets) and fired it at Spider-Man; she accidentally shot and killed Eduardo instead. He died in her arms, reverting to human form as he did so. (Web of Spider-Man II#56) - Eduardo's body was returned to Texas for burial. (Dead No More: The Clone Conspiracy#2 (fb) ) - Lobo's body was retrieved by the new Jackal and cloned, along with dozens of Spider-Man's other friends and foes, as part of a plan to conquer death itself. They were housed in the Underworld, a subterranean section of the Jackal's New U headquarters in San Francisco, and given a daily pill to stave off clone degeneration. (Dead No More: The Clone Conspiracy#2) - The Jackal unveiled Lobo and the other resurrected villains to Spider-Man while he was on a tour of the New U facilities. When the Jackal's Gwen Stacy clone revealed that she was actually Earth-65's Gwen Stacy, who'd infiltrated New U, Lobo and the other villains gave chase. (Dead No More: The Clone Conspiracy#3) - As the villains spread out, Eduardo Lobo, Mysterio, Stilt-Man, Prowler, and Jean DeWolff searched the roof, finding only a broken grate. (Dead No More: The Clone Conspiracy#3 / Amazing Spider-Man IV#23 / Prowler II#4) - The Jackal moved Lobo and the other clones to Haven, an idyllic small town built beneath the Transamerica Pyramid. As they lined up for their daily pill, the Jackal tried again to convince Spider-Man of the rightness of his campaign against death. When Spider-Man refused, he ordered the villains to kill him. Before long, however, the Jackal's erstwhile ally Dr. Octopus activated a device that triggered the mass degeneration of all the Jackal's clones, including Lobo. (Dead No More: The Clone Conspiracy#5 / Prowler II#5) - Maddened by the agonizing degeneration, Lobo and the other villains tried to escape the signal, despite the risk of infecting the world with the Carrion Virus; they were contained by Jean DeWolff, Spider-Woman, Prowler, and the Scarlet Spider. Although a counter-signal that stabilized any surviving clones was eventually broadcast, Lobo was not present for the cleanup; he may have escaped, or completely degenerated. So, what colour are the Lobo Brothers in their wolf forms? In Spectacular #150, 151, and 152, and Web #55, Carlos is brown, Eduardo is black. In Web #53 and 54, they are both black. In Web #51, Eduardo is brown. Plus Carlos is black in his main image from Update '89. I like having some distinction between the Lobos, so I'm gonna say that Eduardo is black, and Carlos is brown. While The Amazing Spider-Man and Captain America in Dr. Doom's Revenge is not explicitly Earth-616 canon, I don't see any reason why it can't be, so I'm cramming it in. Carlos Lobo has a profile in the Official Handbook of the Marvel Universe: Update '89 edition, but Eduardo does not, I guess because he was dead by then. He does have a profile in the manual for The Amazing Spider-Man and Captain America in Dr. Doom's Revenge, but it has a bunch of inaccurate information (it misidentifes Esmelda as Bonita, and says the Lobos built their criminal organization in NYC, not Texas). Maybe it was based on preliminary story notes? The game and its pack-in comic also colour Eduardo's fur brown, but his profile notes that he has dark grey fur. 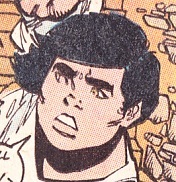 Carlos and Eduardo both have a prominent gray streak in their hair in their first appearance, but it disappears in subsequent issues. Carlos' OHotMU profile mentions that he has "unnamed sisters". This seems to be an error, as they're never mentioned in the comics themselves, which depict the Lobos living alone on the streets; maybe it was based on preliminary story notes, too? At least one sister with the same powers as her brothers first appeared in Scarlet Spider#12.1 (February, 2013). (Spectacular Spider-Man II#152 (fb) ) - Daughter of a wealthy Mexican landowner, Esmelda Valdez met Eduardo Lobo when he helped her after she fell off her spooked horse. They soon fell in love, but were together for a mere two months before her brother, Ramone, who disapproved of their relationship, came after Eduardo. The rage and fear of the confrontation activated Eduardo's mutant powers, and when he transformed, he slew both Ramone and Esmelda. (Spectacular Spider-Man II#152 (fb) ) - Son of a wealthy Mexican landowner, Ramone Valdez disapproved of his sister Esmelda's relationship with Eduardo Lobo. One night, he came after Eduardo, armed with a bullwhip and accompanied by several other men; the rage and fear of the confrontation activated Eduardo's mutant powers, and when he transformed, he slew both Ramone and Esmelda.